be reach the 27 FAD Pin-909427 56 APO, Bikaner on or before 21 days from notification given in employment news paper. For long distance and hill are candidates 28 days from the notification given date. Application will be sent through Speed Post or Registered post only to the recruitment cell of 27 FAD. 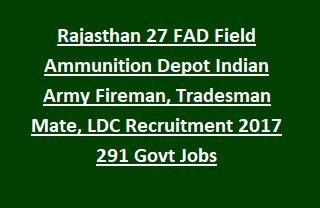 Recruitment of Tradesman, Fireman jobs in 27 FIELD AMMUNITION DEPOT Bikaner selection process, qualifications, procedure of application submission and more is given below. Last date to reach the application forms to 27 FAD: 21 days from given notification. àFor Tradesman Mate and Fireman Jobs Matriculation or 10th pass with knowledge of Hindi. Selection for this TMM and Fireman jobs will be based on physical tests and written exam of 10th standard. (i) Height - 165 cms for ST-162.5 cms. (ii) Chest (Unexpanded) – 81.5 cms + 3.5 Cms on Expansion 85 cms. Fireman jobs Carrying 63.5 Kg weight to a distance of 183 Mtr in 96 Seconds. 1.5 KM run in 6 Mins and Carrying a Weight of 50 Kg to a distance of 200 Mtr in 100 Seconds. Written test will be conducted for 150 marks with 2 hours duration. Total 150 objective type questions will be given and each question carries one mark. OMR Based Test will be conducted. No online exam. Syllabus will be in Matriculation Standard Only as applicable. Application form download from the below given link and submit the filled application along with required documents on or before 21 days of notification given in Employment news. Required documents are given in official notification. Write on Application Cover "APPLICATION FOR THE POSTS OF-----------------". Self addressed envelope affixing postal Stamp of `. 25/-. also send with the application form. 18 FAD Hoshiarpur Recruitment Tradesman Mate, LDC Recruitment 2018: Ministry of Defense, Indian Army, 18 Field Ammunition Depot invites applications from the Indian nationals to recruit the available vacancies of Tradesman Mate, Material Assistant and LDC Posts. There are total 154 vacancies available in current recruitment of Punjab Indian Army 18 FAD Hoshiarpur. The candidates who are willing to serve for Indian Army they can apply for these posts through a specific format and filled application to be reach to the Address of Recruitment Cell, 18 Field Ammunition Depot, PIN – 909718 c/o 56 APO within 21 days from the notification date in Employment News. 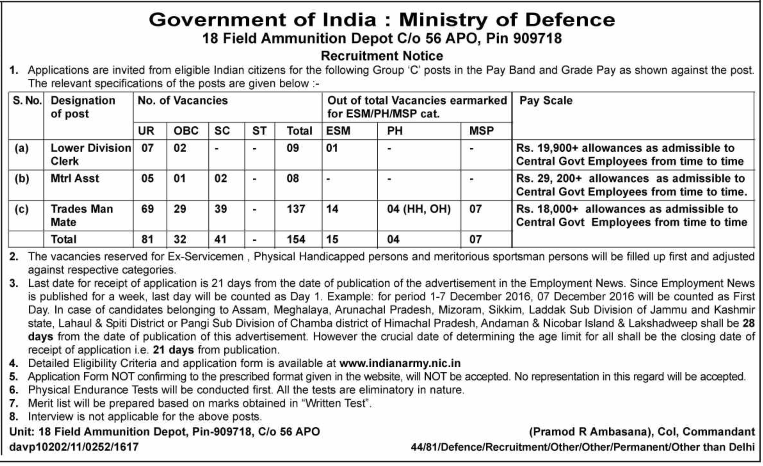 For more information regarding this 18 FIELD AMMUNITION DEPOT Hoshiarpur recruitment please see the data given below. àFor LDC posts matriculation/10th pass and typing speed of 35 wpm in English or 30 wpm in Hindi on computer. àFor Tradesman Mate Matriculation or 10th pass with knowledge of Hindi. For Material Assistant-18 to 27 years, for SC/ST 5 years, OBC 3 years of age relaxation will be given. 18 FAD Recruitment will be held in two stages. Physical Measurements test and written test will be conducted. (i) Height - 165 cms (concession of 2.5 cms height shall be allowed for members of schedule Tribes) . (i) 1.5 KM run in 6 Mins. Candidates finishing after 6 Mins will be rejected for further tests. (ii) Carry a Weight of 20 Kg to a distance of 300 Mtr in 80 Seconds. Candidates finishing after 80 seconds will be rejected for further tests. (iii) Lift 20 Kg Ammunition Box from ground level to above head level, stretch hands straight & bring the box down to ground level (3 times). For LDC post Typing Test will be conducted. For all the posts candidates should have pass written test. Merit list will be prepared based on marks obtained in “Written Test”. Written test will be conducted for 150 marks with 2 hours duration. filling the form neatly attach the attested copies of educational qualifications, Date of Birth, Caste Certificate, Sports or NCC and other required documents and send to the respective Indian army recruitment center address of 18 FIELD AMMUNITION DEPOT Hoshiarpur, Punjab through Ordinary Post/Speed Post/Registered Post. On cover letter must have write "Application For the Posts of-----------------"For more details please see the official notification or information. Self addressed envelope affixing postal Stamp of `. 25/-. to be attached with the application form. SIR, PLEASE GIVE ME 17FAD RECRUITMENT NOTIFICATION NO. FAD ka sabhi Offline hey online nahi..